At La Chaux-de-Fonds, in the heart of the traditional Swiss clockmaking district, we find Francis Jeannin. 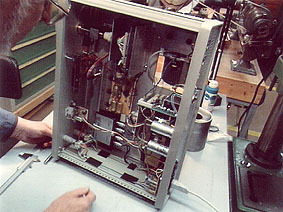 It would seem that some of the Swiss clockmaking skills have gone into the construction of his B 38 cylinder player. It takes a variety of cylinders: Standard, Amberol, Blue Amberol, Dictaphone, Intermediate Salon and Stentor. There are optional mandrels for Graphophone Type A, Lioret and Céleste cylinders and other dimensions on request. The mandrels are hollow and made of vinyl and aluminium on a steel shaft. This shaft can be offset at both ends to compensate for excentric cylinders. 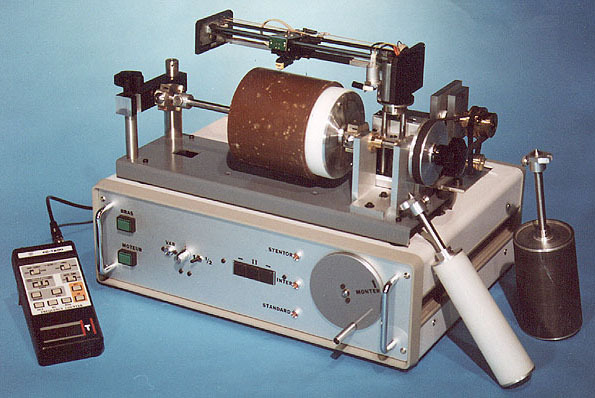 The mandrel is driven via two flat belts by a Revox Studer motor with external rotor and has variable speed 47 - 218 rpm as well as two fixed speeds, 80 and 160 rpm. Speed is read on a display on the front of the player, which takes its information from the speed control card. The drive and the cylinder-arm assembly are placed on antivibrational supports. The cartridge is a Shure M 104 with styli for 2- and 4-minute cylinders. 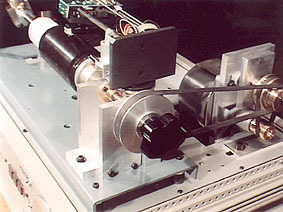 The drive with its two belts and the mechanism to compensate for excentric cylinders. 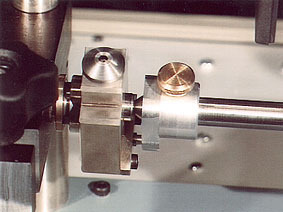 The solid endgate with the shaft that adjusts for excentric cylinders. 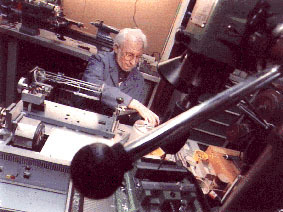 Francis Jeannin working on the B38 phonograph.